Once the working week was over, there were only about 20 hours left to eat to my hearts content. 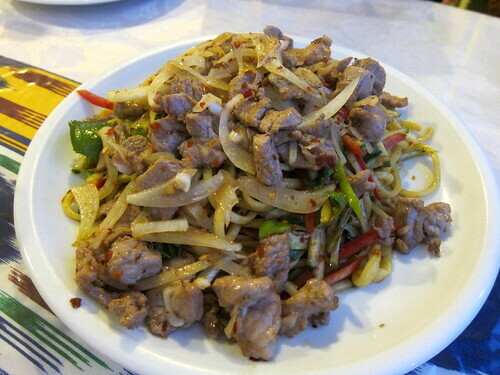 The last dinner was at an Uyghur restaurant recently featured in Lucky Peach magazine. The Kashgar Uyghur Restaurant is located very close to the main train station (München Hauptbahnhof) and on first glance is a fancy kebab joint. We went upstairs where it’s a plain restaurant and you’re handed takeaway menus from which to order. We left it all to a colleague who was the most knowledgeable on Uyghur cuisine (from Xinjiang province in China) and he went ahead and overordered for us all. I don’t have the ‘official’ menu names for anything – everything was listed in Chinese or German, of course. 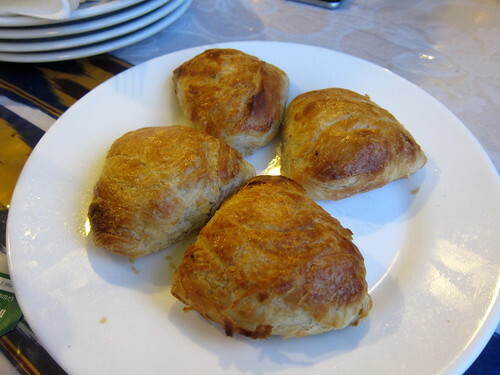 We started with samsa – baked handheld pockets of flaky dough filled with a lightly spiced minced lamb mixture. These were brilliant and I probably could have made a meal of two or three of them. 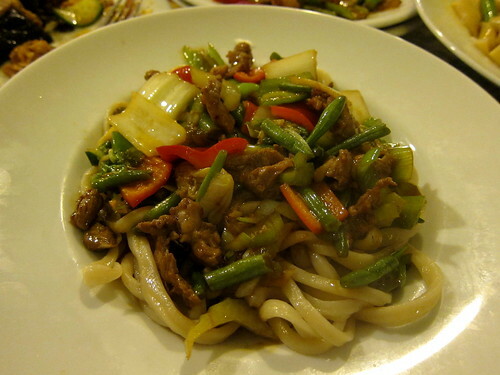 A dish of cold spicy noodles (laghman) were topped with a hot stirfry of lamb and vegetables. Beef stomach was soft and tender, not unlike slurping down beefy jelly. 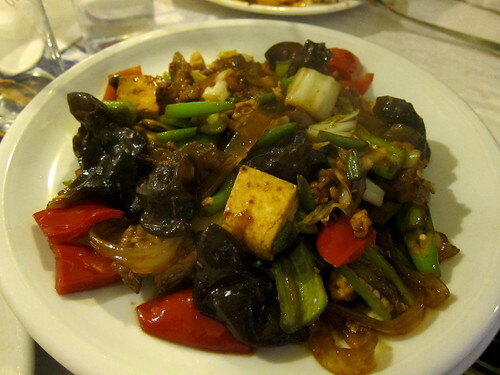 Then came a stir fry….of lots of different things. And so we renamed it the stir fry of everything. Those flattish clear bean noodles were spectacular. Dapanji – Big Plate Chicken – was probably my favourite dish of the evening. 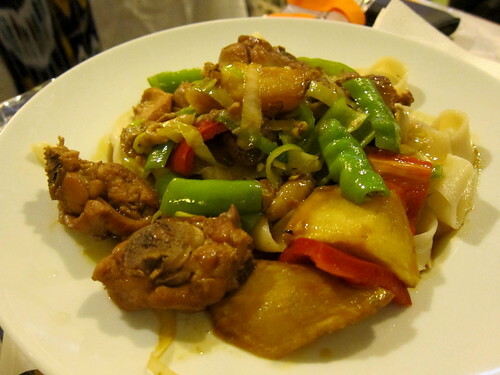 Large flat belt noodles were served with the fabulously delicious bone-in chicken, pepper and potato stew. Here was just a portion for one – my friend would have ordered the larger version had I not stopped him! Another dish! 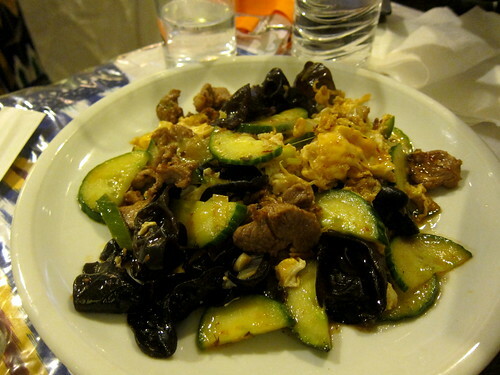 Stir fried egg and cucumber and meat. The mild cucumber was a soothing balm to our now tingling tongues. 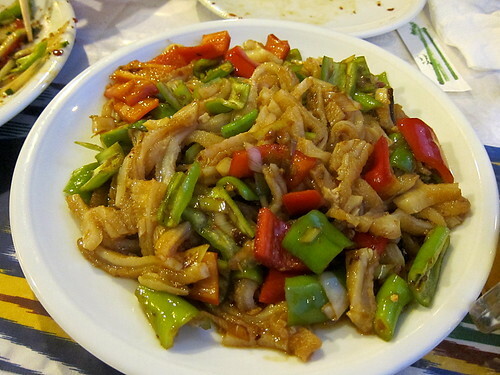 And still there was more – ok, our final dish of stir fried laghman. Excellent as it was, we could only pick at it. Excellent noodles, yes, excellent. Overall, excellent! Highly recommended! There is another Uyghur restaurant nearby (that more resembles a Chinese restaurant) but according to my colleague who tried both, this was the better one. And then on my last morning, before my flight back in the afternoon, I had to fit as many Munich foods as I could into my gob. I didn’t do too badly. 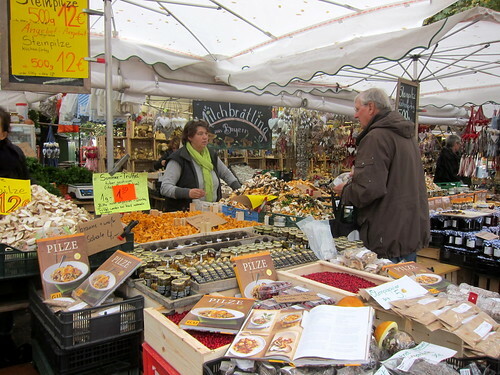 My main stop that morning was the Viktualienmarkt – Munich’s famous outdoor food market. Sure there are tourists around but you’ll also find locals shopping for the week or picking up something a bit special. I joined the locals in the queue at one of the mushroom stalls and bought a mixture of wild mushrooms to cook at home that night. 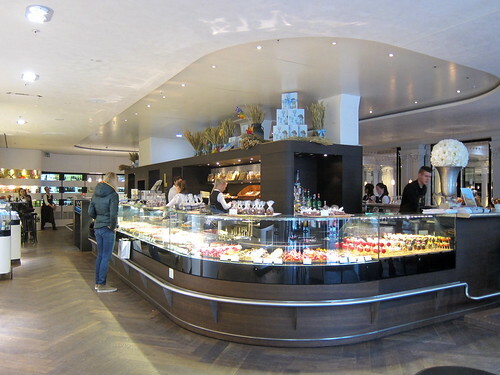 I also stopped at the Münchner Suppenküche, one of my favourite stops from over a decade ago, and I was happy to see that it’s still going strong. 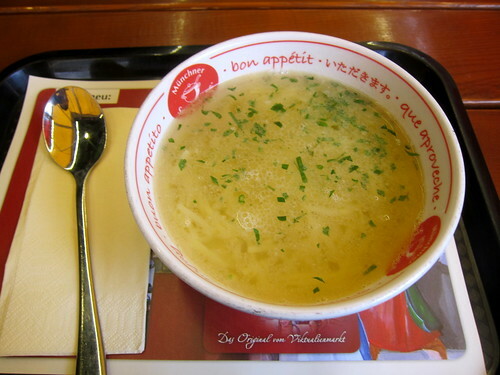 This large bowl of chicken noodle soup was €3,50 and it remains one of the best chicken noodle soups I’ve ever had. Leberkäse! This is one of my most favourite Bavarian foods. Yes, I should have also eaten weisswurst but leberkase! If you’re not familiar with it, I guess I could liken it to posh Spam/bologna. You can get it everywhere. At snack stands, a hot slice will be sandwiched in a roll. In restaurants, a slice is likely to be served with potatoes and a fried egg. As I was noshing on the hoof, it would have to be in a roll for me. 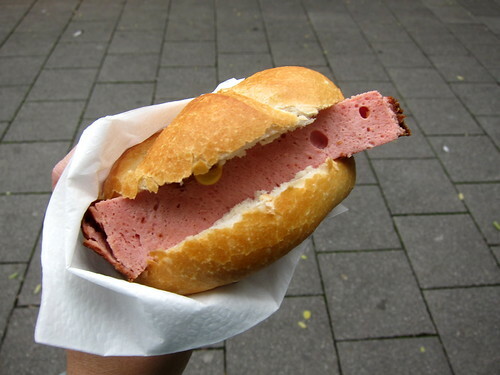 I took a tip from somewhere on the Internet and got my leberkäse in a roll directly from one of the Viktualienmmarkt’s butchers – they’ll slice the hot meatloaf and weigh your slice (nice and thick!) before shoving it into a sliced roll and handing it over. Look at that massive wodge! With a little mustard, it was some fine eating on the hoof while doing some sightseeing in the centre. I had to end my haphazard ‘meal’ with something sweet. 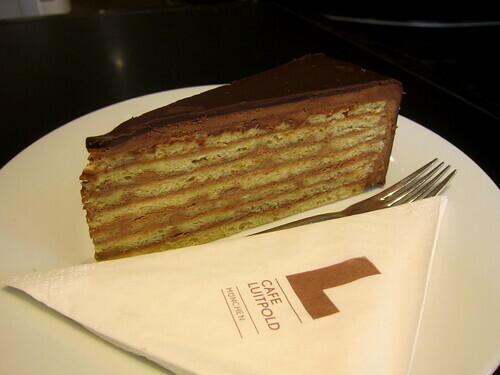 I concluded my tour of Munich with a stop at Cafe Luitpold, close to Odeonsplatz. I only found out later that the breakfasts/brunch here are quite famous but I only had the time and the stomach space for Kaffee und Kuchen. Choosing a cake from the massive display was certainly challenging! But in the end, it was another slice of Prinzregententorte. It was perhaps a more elegant looking slice but taste wise – well, both were excellent! And then it was off to the airport! 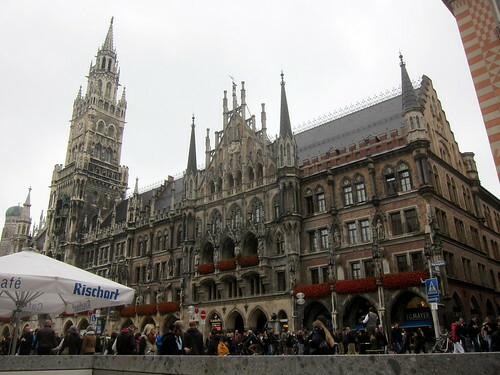 Goodbye, Munich! I love the city! Other points to note include the fact that it’s safe. No one bothers you at night when you’re walking around and everything’s wonderfully clean. The food is good everywhere and there are plenty of options other than Bavarian food nowadays. I do hope to return soon (especially when my kilo of Ritter Sport runs out)! Here’s a general tip – there’s a very well-stocked supermarket at Munich Airport. I bought tonnes of things to shove last minute into my suitcase. All my photos from my trip can be found in this Flickr album. Sounds delicious but too much good things to eat! Have you been to Ritter in Berlin, where you can customise your bar with a choice from dozens of ingredients? I can tell Berlin will be your next stop now ;-). You are quite right – the Edeka supermarket in the airport is really brilliant, also when you come back late or on a Sunday when everywhere is shut, and the prices are almost normal.